In case anyone is concerned that the description ‘experimenting’ seems a bit harsh, the 2001 book Civic Innovation in America: Community Empowerment, Public Policy, and the Movement for Civic Renewal laid out what was sought by the charitable foundations and the White House in the 90s under initiative names like “Reinventing Public Citizenship.” Then it usefully admitted that all this dialoguing and deliberative democracy and new systems of governance are untried theories. Such mass mandates put in place by mayors or regional authorities or school districts thus qualify as mass experimentation. Aka Experimentation on the Masses since psychological processes aimed at behavior change through K-12 education are involved. I am sure you have heard of Robert’s Rules on Process. Well, Robin’s Research Rules say that if the World Bank states on the record that this is called the Rockefeller Process, we can call it that too. Those Rules also get to note that the Rockefeller Process as a practical matter increases the power of the public sector since it looks to the political process to give these groups what they want. Think of it as increasing the Cartel Power of governments at all levels. Connected people just love cartels. 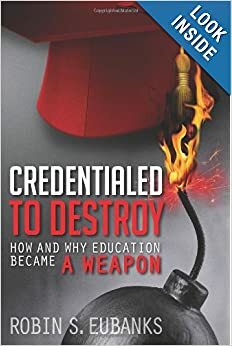 The Mind Arson and psychological manipulation and social and emotional learning emphasis both my book Credentialed to Destroy: How and Why Education Became a Weapon and now this blog just keep encountering also have the effect of increasing the power of the public sector and anyone with ties to political power. It all seems to seek to extinguish the ability and capacity of individuals to decide what they need and get it for themselves. Now I told you in the last post that I wanted to talk about the recent Aspen Institute (you can search for yourself to find out if there are ties to certain great wealth that grew from cartel practices in the past) report Learner at the Center of a Networked World. That report called for ‘new kinds of skills and learning’. Let’s quote again because the crucial point I want to make is that this recent Aspen vision for digital learning and the K-12 classroom is the same as what is being described as Communication for Social Change. It is also the same as what The Deliberative Democracy Handbook said is required for fulfilling its vision. Even more alarmingly the vision fits with what the Club of Rome (search for that connection too if you are bored or wondering if conspiracies around power can be true) called for as ‘innovative learning’ in its Learning Project report issued in 1979. It is now finding its way into regional planning authority mandates on Economic Development and what school districts must be doing. Classrooms that require Collaboration (the 3rd of the 4Cs) and new political structures too. No wonder there is to be a Metropolitan Revolution. No wonder we get this constant emphasis on the Community as a whole with an obligation to “improve the health and welfare of all its members.” Boosting the cartel power of the public sector while telling individuals they are not even entitled to hold on to their own personal preferences. There’s Creativity, that 4th C of 21st Century Skills. Everyone assembled and reporting for duty but in pursuit of Deliberative Democracy and Participatory Governance, not being internationally competitive. Maybe that’s because all these education and policy visions view Planned State Capitalism and its Cartel Power over Everyone Else as the desired 21st Century vision of society and an economy. Cartels do hate individual power. Unconstitutional earthquakes no one would willingly submit to can be hard to prove. Words like governance or mandatory collective decision-making or public goods get thrown about where the implication of a seismic shift is there, but that is rarely good enough to lay out convincingly on a blog that we are at great, demonstrable risk. If all of the actual Common Core implementation, and the digital learning essential component that runs in tandem with it, are actually designed to “give birth to the new systems and structures through which ordinary people are taking responsibility for their own and their community’s futures,” we have every right to have that included in the upfront public explanation of what is really going on. Especially in a world where Human Rights are now quietly touted as involving Economic Justice based on Racial Equity Outcomes. Do tell. So like Fulton County’s Conversion School District Charter, the idea is to use contractual language or laws or regulations to invisibly and nonconsensually bind anyone who might complain or resist once they become aware of this seismic shift in where sovereignty over the citizen and student lies in the 21st century. This turns out to be a global pursuit, but the US has a federal Constitution intended to prevent just this sort of public sector power grab. That would explain the desire to bring this in invisibly via education and regional governance compacts and mission statements and vision reports about metro areas. In case anyone believes that I have an overactive imagination or am reading intentions into perfectly innocent and well-intentioned statements cooperation, here are three links to get your attention that this is a real problem that we were never to recognize in time. The first is The Deliberate Democracy in the Classroom Toolkit created to be compliant with the Common Core classroom and a new vision for what citizenship involves in 21st century America, including new kinds of dispositions. http://cdd.stanford.edu/toolkit/cdd-complete-toolkit.pdf The Toolkit has an interesting view of the relevant facts and obligations and once again PBS has prepared a curriculum called By the People, much as it did for that related transformational curriculum for the Common Core involving Facing History and Ourselves we covered in our recent Human Rights Trilogy. To those of you who have read the book John Dewey’s concept of ‘participatory democracy’ as the means to force economic justice is indeed alive and well and so is his favorite tool of forcing the seismic shift nonconsensually through the schools. The second point also aligns with the book’s disclosures and what the 1966 Yearbook described as intended for metro regions and urban areas and then what Turchenko described in 1976 in that Soviet report that was so quickly translated into English. Bruce Katz, who we first met here http://www.invisibleserfscollar.com/protected-producers-vs-paying-consumerstaxpayerswho-will-prevail-on-education-and-the-economy/ wrote a 2013 book called The Metropolitan Revolution: How Cities and Metros Are Fixing Our Broken Politics and Fragile Economy. The book was published under the “auspices of the Brookings-Rockefeller Project on State and Metropolitan Innovation.” That matters because the Rockefeller charities are clearly pushing the Deliberative Democracy concept hard according to searches I did over the weekend. That’s actually what turned up the Toolkit since By the People was created with funding from the Rockefeller Brothers Fund as it repeatedly states. Someone is pleased with their efforts and is insistent on saying so. I am going to resist the temptation to explain to Bruce Katz that economies cannot be built based on federal grants to create manufacturing institutes around clean energy or voters in LA and Denver voting massive sales tax increases around transit projects. Those are transfers involving bureaucrats spending OPM-Other People’s Money. Zero sum is the best case scenario. Sometimes only a $100 word will do. That Usurpation by Fiat of sovereignty away from the individual in the US system, and then insisting sovereignty that is not supposed to exist in fact now be shared with nebulous regional authorities coordinating around Vision Statements, is absolutely Stealth Authoritarianism. It is the politically connected coercing everyone else to go along. How’s this for an open declaration of radical reshaping? This economic vision will amount to waste, but the hoped-for shift to governance of the individual is intended to survive apparently. I’ll say. The next page says that “private and public sectors will coproduce the public good.” That’s highly doubtful, but it sure makes a good rationale for an unconstitutional usurpation of authority over people and property. I guess we can now think of what we know, own, or can do as merely in our temporary custody. Subject to seizure by the public sector and its cronies in an economic power grab that’s not that different from the serf forced to work land because it benefits the noble landholder. Point 3 relates to that Open Data initiative that was President Obama’s first act on taking office in 2009. We have already seen it used as part of the FuturICT Big Data vision that was troublingly outlined here. http://www.invisibleserfscollar.com/science-fiction-made-real-were-we-ever-to-know-in-time/ When I located this Core Principles for Public Engagement report from 2009 http://ncdd.org/rc/wp-content/uploads/2010/08/PEPfinal-expanded.pdf it made it clear that what I had seen as about data was actually part of an organized redirection of the public and private sectors to begin to collaborate over governance. http://www.whitehouse.gov/sites/default/files/omb/assets/memoranda_fy2009/m09-12.pdf is the actual memo. Hard to believe that the Administration that has supposedly lost incriminating IRS e-mails after they were subpoenaed actually meant to become Transparent, but that National Center for Dialogue & Deliberation makes it quite clear that this vision of public participation and collaboration is very crucial to that openly declared intention of fundamental transformation. The better to bind us by and invisibly shift sovereignty going forward apparently. This is a good breaking point before I launch into explaining how the mindset perfectly suited for Deliberative Democracy per that Handbook is also the precise Mindset and malleable Worldview that the Common Core and digital learning state that they want to create. Plus I do not think it’s coincidental that the name of the new Aspen Center report on digital learning and the new kind of mindset needed–“Learner at the Center of a Networked World” uses one of Bruce Katz’s favorite expressions for his desired metro-led economy of the 21st century–the ‘networked world’. We are so far beyond having to infer any more from a Dog that Did Not Bark in our investigations of what is really going on in education. And what is intended for most of us. Stealth Usurpation. What a phrase. In my ongoing pursuit to track precisely what future is being planned for us, why education is being so radically altered in deceitful ways without consent, and why so many people assume people now exist to be governed and dictated to through political power I went back to that Humane Governance book I mentioned in the last post. Sure enough, in order to offer comprehensive rights “to those most vulnerable” as well as “all peoples on earth” Falk called for “a proper ordering of political life at all levels of social interactions” including the home and personal relationships. We may grasp that such officially sanctioned meddling is likely to turn the world into those who seize, those whose time or property are seized, and distributees, but it really is the new theory of rightful political and economic power being pushed in the 21st century. Another lost invite. Someone who was not only invited but was a co-sponsor of the conference was Everyday Democracy, which is the new name for what used to be called the Study Circles Resource Center. Along with the Southern Poverty Law Center we keep encountering as it protects the Common Core, SCRC created this Upper Grades Handbook called “Reaching Across Boundaries: Talk to Create Change” http://www.racialequitytools.org/resourcefiles/mixitup.pdf in an earlier commitment to required dialogues to supposedly create healthy school communities and a Positive School Climate where “every student can grow socially and academically.” Note that order of priority. That handbook remains in print because this is the kind of transformative school program where all children can be deemed to succeed and ‘grow.’ Plus there is that useful change to the acceptable norms of society beliefs and values. Once again this focus in K-12 is equitable, since everyone has emotions, and transformative for “creating a more equitable and just future.” Just what Falk envisioned as Humane Governance and why Gorbachev joined in in 1986. Race becomes the way to transform behaviors in the West and consciousness all at the same time plus seize economic power. Truly who needs a Cold War when there’s education. Well, that was a 2002 paper. Maybe the Aspen Institute and the Rockefeller Foundation (which also funded WOMP) has rejected such a vision of Race Equity and the intertwining of Education and Community (then why was this on naesp’s website yesterday?) http://www.naesp.org/resources/1/A_New_Day_for_Learning_Resources/Building_and_Sustaining_Partnerships/Education_and_Community_Building_Connecting_Two_Worlds.pdf Unfortunately though a new acronym RETOC and a 2008 publication date show that these unfortunate theories just keep getting more influential as the basis for government decision-making along with nonprofits and charitable foundations. RETOC is short for Racial Equity Theory of Change and it is “the desired alternative to white privilege. Racial equity paints a radically different social outcomes ‘picture’ in which race is not consistently and predictably associated with disadvantage. It envisions a fairer America in which race is not associated with merit and social opportunities. With racial equity, we would not have social strata, prisons, schools, boardrooms and communities that are distinguished by their skewed racial profiles. And if all this meddling and required restructuring of social interactions and relationships extinguishes much of those resources targeted so everyone can succeed, what then? What if the REO-desired Racial Equity Outcome–is not just something that can be imposed or dictated? What will be the effect of targeting the ‘Nuts and Bolts’ of Local power to force these REOs? Governance becomes necessary so that “decision making bodies at the state, local, or regional levels” can dictate the desired changes, whatever the actual costs. So far that outcry has not been a problem because these REOs are being pursued but not under the actual Theory of Change. Not under the name Racial Equity Outcomes. The sought ‘backward mapping’ is going on in the schools, but it goes by names like Growth or Positive School Climate or Equitable Engagement of All Students. The function of transformative change and the seizure of powers of governance without admitting it’s about REO and eliminating Structural Racism. In writing of the related Humane Governance, Professor Falk acknowledged that this is all about pursuing a “democratizing agenda of bringing law and popular participation to bear upon policies that control the exercise of economic and political power.” Race is just the excuse for seizing that power for the public sector and its allies. It offers emotions of grievance that have been carefully cultivated and boots on the ground voting for transformative change via seizure. And no one pushing Humane Governance or Racial Equity seems to be grasping that if true wealth is the mind and what it is capable of, these policies may well be creating piles of dust. No one can seize what has ceased to exist. Creating a sense of righteous revenge in some groups and an obligation to allow predation in others only creates human betterment in a fantasy world. But we can only confront the likely reality if we recognize what is now being pushed in the name of Equity and Democracy. Consider this post that recognition. Education is the entry way, but it is by no means the ultimate goal. Those of us who want to believe that all would be well if only all decisions were made locally instead of at state, federal, or international levels should be aware that the Local was preselected back in the mid-80s as the place where “equity, implementation of human rights, promotion of democracy, and environmental protection” could best be invisibly put into place, especially in the capitalistic West like Canada, the UK, Australia, and the US. It was at the local level that the “world must evolve structures of governance (not necessarily government) that offer improved prospects of achieving sustainability…and decency.” The global belief that the local is the place to impose authoritarianism while pretending it is participatory democracy can also be seen here http://www.ted.com/talks/benjamin_barber_why_mayors_should_rule_the_world as long time activist Benjamin Barber wants binding power now centered in the cities. That was the conclusion of a book Education for the Twenty-First Century published simultaneously in 1993 in the UK, Canada, and the US. That’s a lot of kick starting via the schools of a new vision of values to guide perceptions of reality going forward. The reason the core, then and now, of transformative changes in human behavior has to be values is because human values guide preferences. If you want social action for change, education and other social institutions where people gather, like religions or mass media programming, have to constantly be pushing the envelope on values and ethical issues and reimagining morality. And you wondered why values clarification suddenly dropped into the schools in the 90s or why a Kairos Center is being launched now. Another one of those assumptions that was invisibly altered in the 80s and early 90s to commence the social and economic justice assault on the West was to push Socio-Economics as envisioned by the very same Professor Amitai Etzioni regarded as the Communitarianism Guru. We first encountered his work being cited to justify Positive School Climates and Positive Behavior interventions for all students. Then he came up again when we discovered the communitarian focus for what Career Ready Standards actually meant. http://www.invisibleserfscollar.com/does-common-core-target-hearts-and-minds-to-sway-future-voters/ Big surprise. His work on the ‘totality’ having primacy over the individual is to guide this new vision of economics. No wonder his work keeps making uninvited appearances. Let’s take a look at the three characteristics an economic system must adopt to prepare for the kind of reorientation Etzioni, WOMP, Gorbachev, and too many others in well-compensated positions of leadership have decreed without our consent. Being shaped and then imposed invisibly via education: K-12 and college and now preschool and graduate programs. First, the individual is no longer to be independent and able to exercise their own free will. Instead, he or she must see themselves as interdependent. Part of interlocking systems. So when we have come across initiatives like Fostering Communities of Learners that are to be required and made a measure of whether a Principal is deemed Effective, that focus is priming students and teachers for the new way the economic and social systems of the future are to work. The second rejection is the idea of maximizing value from a given choice. Instead, the emphasis shifts to ‘satisficing behavior’–good enough. No need to hold out for the ideal or a perfect fit. Students practice for this element of the reenvisioned social and economic systems via all those ‘rigorous’ assessments where there is no correct answer or the material has never been taught. It is what counts as operating at Higher Levels of Thinking under a Depth of Knowledge template for evaluating student work. Practicing a good enough strategy and being willing to act anyway. In satisficing behavior the focus is always on the future so that image of what could be can begin to reshape the current reality. Once again brought to you by people paid to push these pernicious ideas without having to live with the consequences. Yet anyway. So just as many of us have feared all this pushing for consensus and mentions of governance really can accurately be viewed as authoritarianism imposed in the 21st century from below, rather than above. Locally, instead of globally even if it is the international wanna-be nomenklatura class that has always been behind the advocacy and architecture of these local and Totality visions of the future. I am going to continue to talk about this atrocious binding vision of Governance in the next post. I may have forgotten to mention that some of this post came from what is laid out in another WOMP book On Humane Governance: Toward a New Global Politics. Not if, and I mean this sincerely, I can still write and type and speak. There will be nothing humane in the end about this vision of the future. I want to end with a question. Have you noticed the sudden rise of signs guiding people to the physical location of the Chamber of Commerce in your community? Perhaps that is because, previously unbeknownst to us, “in the totality model, the means of resolving potential areas of conflict will be institutionalized within the economic system.” Suddenly then the Chamber’s headquarters may be as important for prosecuting interests as the courthouse or state capitol. At the table or on the menu has always been the reality in a politically planned and directed economy. Did you notice in all this collusion at our expense no one is the least bit concerned with our welfare? And to think all these truly lousy ideas are coming at us first and foremost through the schools. That of course would be precisely where the rollback needs to start as well. I was going to call our conclusion of the Human Rights Trilogy by a different title. “Quietly Enshrining a Global Ethic of Binding Values, Irrevocable Standards, and Requisite Personal Attitudes” would have aptly communicated the intended lack of tolerated diversity of opinions in the future. If those aims, authorized and enforced by government officials and publicly-funded institutions like schools or charitable foundations, seem like fundamental infringements to us, perhaps, it is because so many of the explicit plans intended to bind all of us–irrevocably is the giddy term I regularly encounter–are not on our radar. We look at education in light of what it meant to us or it needs to be or at religion in light of our personal faith. “Young people must learn at home and at school that property, limited though it may be, carries with it an obligation, and that its uses should at the same time serve the common good. Only thus can a just economic order be built up. The emphasis we keep encountering in Radical Education Reform and the actual Common Core implementation on the Whole Child, social and emotional learning, Positive School Climate, mindfulness training, Engaging Activities for All students, are all ultimately teeing up precisely what advocates of a new Universal Consensus Global Ethic to obtain a Just Economic Order want and need targeted. And I am not being Scrooge or a Selfish Sally pointing all this out. I just think we may end up with a world that works about as well in the future as the typical US VA hospital does now if we are not careful. After all Facing History and Ourselves ended its Choosing to Participate curriculum we have looked at in this Trilogy by creating the mistaken belief that the War on Poverty in the 1960s had its available resources, and thus its chance for success, cut by the competition for funds from the Vietnam War. One way to look at that NEA CARE Guide and the FHAO curricula we have been looking at is to prime young people for the very Global Ethic and Human Rights vision all these advocates desire. If you remember President Obama desperately sought to nominate a federal appellate judge who saw national education standards as the avenue to push just such an economic justice as a legal right vision. http://www.invisibleserfscollar.com/morphing-the-common-core-into-a-new-rewritten-us-constitution-by-mandating-false-beliefs/ When I first encountered FHAO I wrote that misteaching the causes of the Holocaust struck me as a most dangerous thing. These curricula designed to inspire, tug at the heart strings, or nurture grievances–whatever will prompt future actions for transformative change–are also playing in a most dangerous cultural zone. Not a helpful worldview to be sponsoring. To think I once wondered why a school district math director in a meeting with suburban parents concerned about integrated math started off with such a look of abject malevolence towards the parents before a word was spoken. So much cultivated antipathy, grounded in inaccuracies, to fuel political transformation. Not just in education graduate programs but throughout the social sciences especially. Credentialed to Destroy indeed. Following up on Dr Tucker led me to the US Human Rights Fund http://www.thesunriseinitiative.org/Resources/2.%20Larry%20Cox%20&%20Dorothy%20Q%20Thomas%20Remarks.pdf and Larry Cox explaining that the Ford Foundation “has long played a critical and invaluable role in building a global human rights movement.” If you believe such work will require a Revolution of the Mind, as Ford named a Tucker paper it underwrote, it certainly explains so much of Ford’s education and Line of Plenty economic justice grantmaking. Speaking of Larry Cox, on November 15, 2013, the latest initiative to finally achieve that Global Ethic from 1993 as well as Martin Luther King’s Beloved Community launched. The Kairos Center for Religions, Rights and Social Justice http://kairoscenter.org/ is headed by Cox and is seen as a movement to finally fulfill the UN’s Universal Declaration of Human Rights. Kairos is an ancient Greek word for a time when conditions are right for the accomplishment of a crucial action; the opportune and decisive moment; also a moment when the eternal breaks into history. That would NOT be history as in past events, but history that deliberately misportrays past events to justify action in the present to try to alter the future. Lots of people now are using both education and religion and any other institution they can control to take those crucial actions in what they see as a decisive moment. Economic and Social Justice as a Human Right. What if all that is left after the Mind Arson, the Personality Manipulation, the Consciousness Transformation, and the Redistribution is a right to the dust of what once made us great?